THE iconic Surfers Paradise precinct is set to be transformed into a sea-inspired sandscape as the annual Sand Safari Arts Festival creates a sandstorm of creativity from Friday, February 8 to Sunday, February 24 2019. An initiative of Surfers Paradise Alliance (SPA), the free, family-focused event facilitates the exhibition of bold works of art inspired by the sun, sand and sea Surfers Paradise is famous for. With a unique yet fitting backdrop of the pristine Surfers Paradise beachfront, the significant cultural event will see people of all ages engaging and appreciating the new large-scale art pieces that are being exclusively created for the festival. The biggest sand-and-sea-inspired event in the Asia-Pacific region will spread beyond the beachside precinct and throughout the Gold Coast with large-scale sand sculptures,a cast of soldier crabs and community arts and crafts zones appearing in libraries, shopping centres and public places for Sand Trail from 19 January to 24 February. 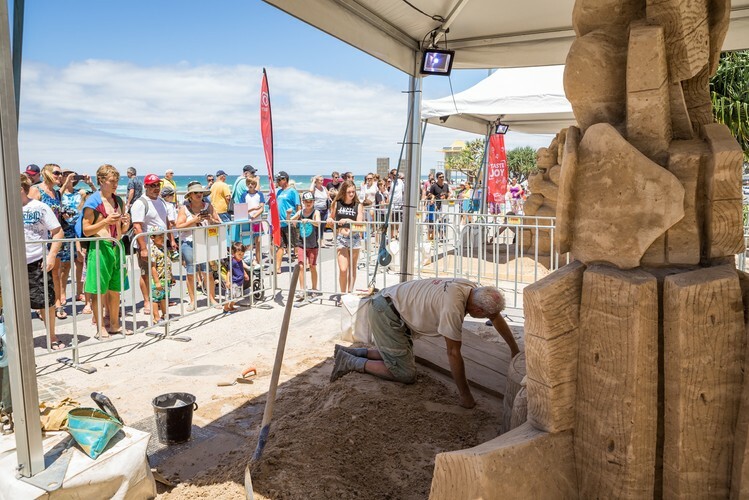 The event will host the Australian Sand Sculpturing Championships from February 8 to 10 where families will have the chance to watch on as 10 International and Australian sculptors each get to work on 10-tonne of sand to create an intricate, life-sized masterpiece to the theme Treasures of the Sea. Sand Safari will delight the smallest of attendees with the opportunity to discover the colourful characters of Heidi & Jake’s Treasure Hunt Adventure, the story which captures the adventures of Heidi and friends as they learn the true value of friendship. Guests at this year’s event will have the opportunity to immerse themselves in a Walk-Through Sculpture created from 60-tonnes of sand. Complete with lights and sound effects, the sensory experience should be visited both day and night. Kids can be amongst their sandy friends from the book for a minute or two atop Treasure Rock, a gigantic Interactive Chair sand sculpture made from 12-tonnes of sand. They may have to move over for the mermaids though, who will be taking the throne to host Live Mermaid Readings throughout the duration of the event. Instigating a togetherness, the event will invite visitors to join in the exhibit by adding their own personal message to Sand Safari for a Community Artwork. Focusing on the event’s theme ‘Treasures in Paradise’, the one-of-a-kind artwork will take shape as members of the community add their contribution containing a personal message about what they truly treasure.